Summer is the prime season for dehydration, as hot days mean more sweating. How much fluid do you need each day to stay well-hydrated? The Institute of Medicine recommends 91 ounces of total fluids each day for adult women, and 125 ounces a day for adult men. Keep in mind – that is total fluids, and foods consumed will provide about 20 percent of that. Translating for your shoppers, this means that women should try to drink nine eight ounce glasses of liquids each day, while men should strive for twelve to thirteen. Especially hot or humid days may call for even more. 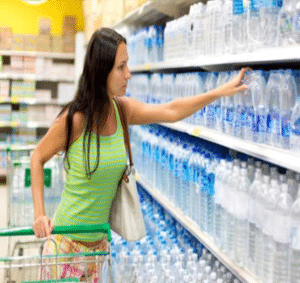 Nestle Waters North America provides this list of common symptoms of moderate dehydration, to be on the lookout for in both children and adults: infrequent need to urinate, darker yellow urine, dry mouth, headache, muscle cramps and dry, cool skin. More severe dehydration can lead to confusion, dizziness and overall listlessness. coffee and tea, skim or low-fat milk. And while whole fruit is preferred, it’s okay to get up to half of daily fruit servings from 100 percent fruit juice. calories per serving) each day is one of the easiest diet health swaps you can make. It would cut about 50,000 calories and more than 65 cups of sugar from your diet in a year!